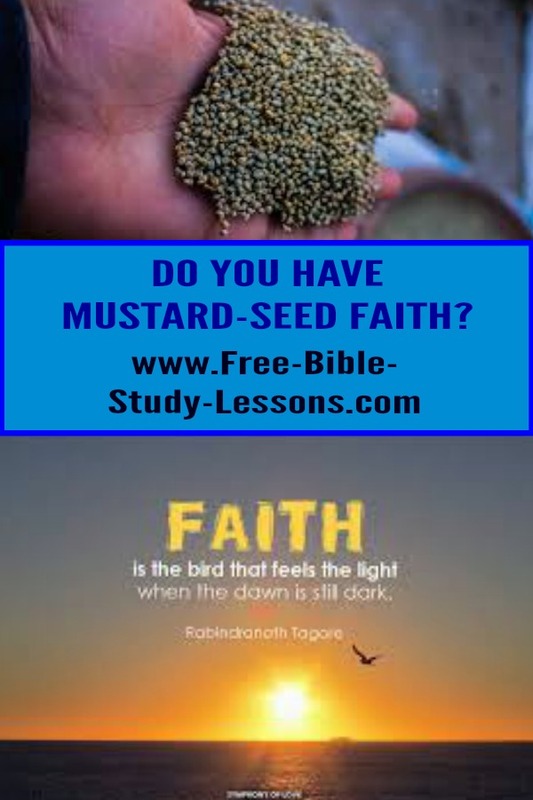 Mustard seed faith refers to two different sayings of Jesus. In Matt. 17:20 the disciples had failed to cast out a demon. When they asked Jesus why they had failed He replied that it was because of their unbelief for they only needed faith the size of a mustard seed. In Luke 17:6 Jesus had just finished talking about forgiveness when the disciples asked Him to increase their faith. Jesus replied to them again that they only really needed faith the size of a mustard seed. Before we look at mustard seed faith we need to know the meaning of faith. What is the definition of faith? Fortunately, the Bible itself gives us the faith definition. We find this in Heb. 11:1. "NOW FAITH is the assurance (the confirmation, the title deed) of the things [we] hope for, being the proof of things [we] do not see and the conviction of their reality [faith perceiving as real fact what is not revealed to the senses]." Amp. We can see from the Bible's own definition that faith is something firm. It is not desire or even a belief. It is the solid knowledge that something that has not happened yet or for which we do not have physical evidence is nevertheless going to happen. The word "hope" confuses some modern readers because it has changed meaning over time. Today when we say we "hope" something is going to happen we mean it is our desire, but often we do not think it is very likely. Biblical hope is entirely different. Biblical hope means you know something is going to happen. You have complete confidence that it will happen. Let me illustrate it this way. Your 6 year-old son asks you to take him to McDonalds for lunch. He hopes [modern definition] that you will fulfill his desire, but he has nothing to really base his hope on. Now let's suppose that you promise your son that if he cleans his room well you will take him to McDonalds for lunch. Now he can have hope [Biblical definition]. He has a conditional promise. As long as he does his part he can have complete confidence that he will be able to go to McDonalds for lunch. It still hasn't happened. He has no physical evidence that it will happen...but he has your word and the knowledge that you are trustworthy and that is enough. In the same way our hope is built on the sure foundation of the Word of God. Many things may not yet have happened or they happened in the past [the cross] but we have absolute confidence that they will happen or that when they did happen they accomplished what the Word of God said they accomplished. That is Biblical hope. Now faith takes that hope and acts as if it really is true. An excellent Biblical example is Peter walking on water [Matt. 14]. Peter got the promise from Jesus that he could walk on water. While still in the boat he had Biblical hope - the firm word of God that it would happen. Faith made him step out of the boat as if he was stepping onto solid ground [which is different than if you expect to go out of a boat into water]. Faith took the hope and acted as if it was true...only to discover that it was true. One other important thing about faith: It is a gift from God. Faith is a gift. It is not something we earn or work for. God gives it freely. So how does all this relate to mustard seed faith? If such a small amount will do so much, how come we tend to do so little? Often we, like the disciples, cry out, "Lord, increase our faith." We want, at least, mustard seed faith. Read Luke 17:1-10. Did you notice that Jesus did not really respond to their request? Jesus told them all they needed was mustard seed faith, but He never told them how to get mustard seed faith...or did He? Read the passage again. Did you see it? First, we know that the initial amount of faith is a gift from God. If you are a believer in Jesus Christ, you know you have that. Second, God gives all His gifts in seed form and He expects us to develop them. If you look at the parable Jesus told directly following verse 6, you will have the key to increasing your faith. Basically Jesus told his disciples an eternal principle of God: use what you have or lose it. Faith is used or exercised through obedience. And Jesus warned against pride. If we do some great thing that does not make us God's Man Of Faith And Power For This Crisis Hour. We have only done what was expected us...we may not even have reached mustard seed faith. So do you want more faith? Use what you have. Be obedient to every command of God you know about. Some of them will go against your natural logic or desire [tithing, no lustful thoughts, self-control, patience], but faith stands on the Word of God. Obedience by obedience your faith will grow.